Szilárd Miklós, Stateless Anthropology, 2014, mixed media. Installation view. This exhibition is both a political statement on art’s present condition in Bucharest and a reiteration of the curatorial mission of this center, which is run by the city’s National Museum of Contemporary Art, and is focused on encouraging young artists to produce art in a place that lacks such initiatives. Szilárd Miklós’s Video-Portrait of a Tent, 2014, documents a little-known international performance-art festival, AnnArt, that took place between 1990 and 1999 in Romania. Miklós’s hour-long video was created from a montage of the entire archive of the festival. 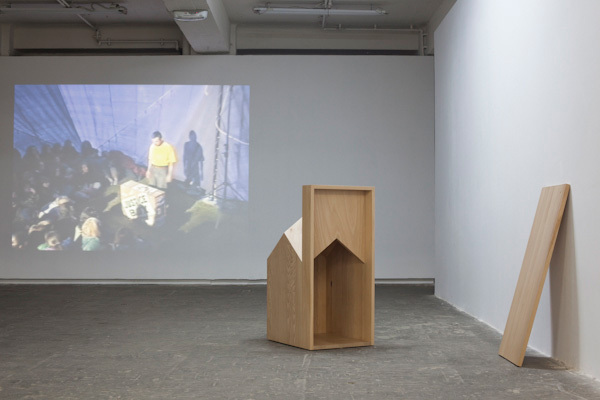 A sketch from the same archive and a prototype of furniture by Szilárd are also included, all centered around the image of a tent—a leitmotif for a community and an institution, that of performance, which accepts its precariousness and temporariness as a rule of existence. Vlad Basalici’s one-minute video Broken Intervals, 2012, in turn, is a contemplation of time’s indirect influence on historical moments: Here, the montage process leaves out the full image and keeps only corners from VHS tapes documenting the 1989 revolution, the corners specifying the date and hour. The result is a Farockian patchwork of coexisting times, which make sense when shown simultaneously rather than ordered chronologically. At the end of the exhibition’s run, Veda Popovici’s plaster The Migrant’s Monument, 2014, a rectangular plaque announcing the future erection of a monument “dedicated to all those who have crossed national and international borders,” will be encased at one of the two international bus stations in Bucharest. The show seems a constructed discourse for what Giorgio Agamben called “whatever singularities”; it’s an expression for artistic de-territoriality in a time of new territories.